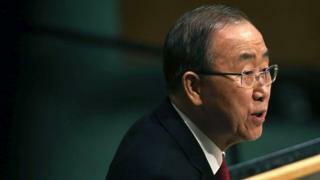 UN Secretary General Ban Ki-moon has said he hopes to visit North Korea "at the earliest time", but that no decision has been made. It was his first acknowledgement that discussions are ongoing. The two Koreas are scheduled to hold rare talks on Thursday aimed at improving relations. The meeting would be the first between the two sides since August when tensions bubbled over into a brief exchange of fire at the heavily guarded border. On Tuesday North Korea criticised the South for staging a live-fire drill near their disputed sea border saying it might respond to the "confrontation". Mr Ban, who is a former South Korean foreign minister, has repeatedly said he is willing to "play any constructive role" to work for peace, stability and dialogue on the Korean Peninsula. A planned visit by him to North Korea in May was abruptly cancelled. But then last week, South Korea's Yonhap news agency cited an unnamed official saying a visit had been scheduled. The media reports sparked a denial from the United Nations. Speaking to reporters on Monday, Mr Ban said there had been "positive signs" about a future visit. "We are discussing when would be the good time for me to visit the North, but so far nothing has been decided," he said, adding that he was working to make the trip "at the earliest time". If the visit goes ahead, Mr Ban would only be the third UN chief to visit the North, which faces UN sanctions because of its nuclear weapons programme. The two Koreas remain technically at war as no peace treaty was signed after the 1950-1953 war.